Although your smile wouldn't be the same without them, there's more to your gums than their looks. Besides helping to hold your teeth in place, they're also an important protective barrier for their roots. Unfortunately, gums aren't immune to disease, especially periodontal (gum) disease. This bacterial infection, triggered by built-up dental plaque on teeth due to insufficient oral hygiene, can cause the gum tissues to detach from teeth and shrink back (recede). This can make your teeth more sensitive to hot or cold foods and beverages, as well as put them at even greater risk for tooth decay. To treat gum recession, our first priority is to stop any ongoing gum disease through aggressive plaque removal. Depending on severity, this could require clinical procedures like scaling or root planing to remove plaque and tartar (hardened plaque deposits) at or below the gum line. This is especially crucial for improving gum tissue healing and stimulating potential reattachment. 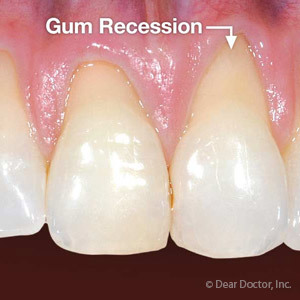 Revitalizing gum tissues this way naturally has a better chance of occurring if we're able to prevent recession before it reaches the roots. If that does happen and we have sufficient gum tissue attachment remaining, we may need to give the gum tissue a helping hand through gum grafting surgery. There are a number of techniques depending on the circumstances, but they all use either tissue from another location in the patient's mouth or prepared tissue from another human donor. This type of surgery requires great skill and expertise, not to mention an aesthetic sense, to achieve a result that's both functional and attractive. Other than daily brushing and flossing, the most important thing you can do for gum health is to see us as soon as you notice any signs of gum problems like swelling, bleeding or tooth sensitivity. The sooner we can diagnose and begin treating the problem, the less likely any gum recession will have a long-term impact on your health. If you've undergone treatment for periodontal (gum) disease, you know how involved it can be. After several sessions of plaque and calculus (hardened plaque deposits) removal, your swollen, red gums finally begin to regain their healthy pink color. But with gum disease, the battle may be over but not necessarily the war. If we don't remain vigilant, there's a high chance you'll experience a re-infection. That's why periodontal maintenance (PM) is so important for gum disease patients after treatment. Plaque, the thin film of bacteria and food particles responsible for the infection, can grow again on your tooth surfaces as it did before. You'll have to practice diligent, daily brushing and flossing to curb that development. But it's also important to keep up regular dental visits for advanced cleaning to remove hard to reach plaque and calculus. For most people that's usually twice a year, but for gum disease patients it could be up to four times a year, especially just after treatment. And there's more to these visits than cleaning. Since our goal is to reduce the chances of re-infection as much as possible, we'll thoroughly examine your teeth, gums and any implants for signs of disease (we'll also include an oral cancer screening). We want to assess the health of your teeth and gums and to see how well you're doing hygiene-wise with plaque control. If we find signs of gum disease, we'll discuss this with you and schedule a new round of treatment. The sooner we initiate treatment, the better your outcome. In some cases, we may perform procedures that make it easier to access and clean areas where plaque tends to build up. Overall, we want to prevent the occurrence of any future disease and treat it as soon as possible if it re-occurs. Keeping up diligent PM will help ensure your gums continue to stay healthy. If you would like more information on after care following periodontal (gum) disease, please contact us or schedule an appointment for a consultation. Periodontal (gum) diseases are sometimes called “silent” because those who have them may not experience painful symptoms. But certain signs point to the existence of these common diseases. If you are experiencing any of the symptoms below, it is time to visit our office so these problems can be treated before they lead to serious infection and loss of teeth. Gums that bleed during the brushing of teeth. Some people think that gums bleed from brushing too hard. In fact, healthy gum tissues will not bleed with normal brushing. The usual cause of bleeding gums is an accumulation of dental plaque in the areas where your teeth meet your gums. Plaque is a film of bacteria, called a biofilm, which accumulates on your teeth. If you are not brushing and flossing effectively, plaque irritates your gum tissues and causes an inflammation and swelling called gingivitis. This causes your gums to bleed easily on contact with a toothbrush or floss. Gum tissues that appear red and swollen. If plaque is allowed to accumulate for 24 hours or more, the inflammation in your gum tissues becomes chronic. The continuous presence of bacteria makes it impossible for your body's natural defenses to fight the infection. Chronic inflammation leads to a breakdown of the normal attachment between the teeth and the gums, causing the formation of “pockets.” Inside these pockets the infection continues to attack the tissues that support your teeth. Eventually this can lead to a breakdown of the bone that surrounds your teeth. Bad breath. Bad breath is another sign of accumulated plaque. The bacteria in plaque may emit gases that have an unpleasant odor. Gums that are sensitive to hot or cold. Chronic inflammation can also cause the gums to recede, exposing the roots of the teeth in which nerves may be close to the surface, leading to sensitivity to heat and cold. Teeth that are getting loose, or a painful area in the gums. If you experience these symptoms, the infection has progressed a long way from the “silent” stage. It is time to seek immediate professional help. If you answered “yes” to any of the above questions, a professional dental examination is in order. With daily removal of plaque by effective brushing and flossing, along with frequent professional cleanings to remove any plaque that you were unable to catch, you will go a long way to preventing periodontal disease. Also, be aware that smoking tends to mask the effects of gum disease. Generally, if you smoke your gums will not bleed when brushing or flossing, nor will they show signs of swelling. What's at the Root of Tooth Sensitivity? Who's Afraid of Dental Implant Surgery?